Skiing and snowboarding (SS) continue to increase in popularity. Although most enjoy these activities safely, personal protective equipment is typically restricted solely to helmets, raising the question as to whether these activities could result in renal trauma severity equivalent to that of more dramatic and more commonly encountered mechanisms including motor vehicle, ATV, and motorcycle collisions. We sought to describe the spectrum of injury associated with SS and compare with other sources of blunt renal trauma. A retrospective chart review was performed on all patients presenting with renal trauma at our institution between January 2008 and October, 2016. Patients <18 years were excluded. Demographics, renal trauma grade (1-5), and type of intervention (observation, embolization, or nephrectomy) if any were determined. Renal trauma grade was determined using computed tomography images based on the American Association for the Surgery of Trauma (AAST) classification. Differences in demographics, renal laceration score, and intervention were compared between groups using t-test and chi squared analysis. We identified 160 patients with renal trauma with average age 32 years (+/- 17years), 2.5% female (4/160). Of these 160, 15% (24/160) suffered renal trauma due to SS. 80% (19/24) were due to snowboarding. Patients undergoing renal trauma secondary to SS were more likely to be younger 27yrs (+/-9) vs. 37yrs. (+/-17) [p<0.001]. The SS cohort demonstrated a significantly higher proportion of higher grade renal injuries, p = 0.03 (figure 1), however, there was no difference in intervention rates between groups (8% vs. 9%, p=0.83). 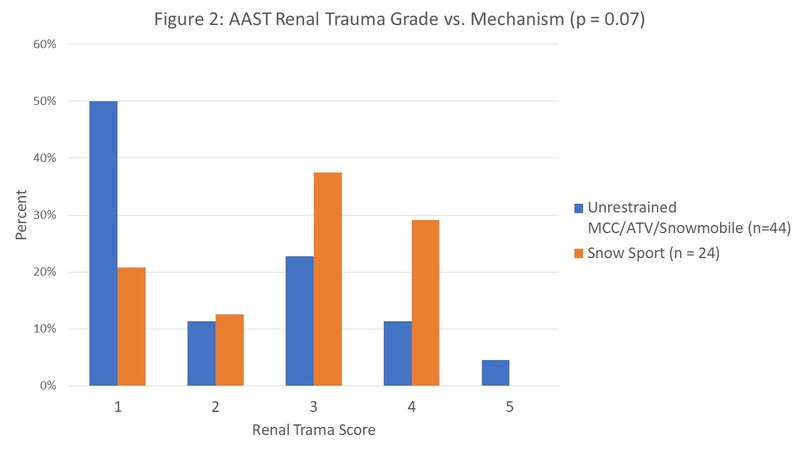 SS (24/68) had an similar risk of renal trauma severity compared to the unrestrained high speed trauma mechanisms (Motorcycle/ATV/snowmobile)(44/68), p = 0.07 (figure 2). 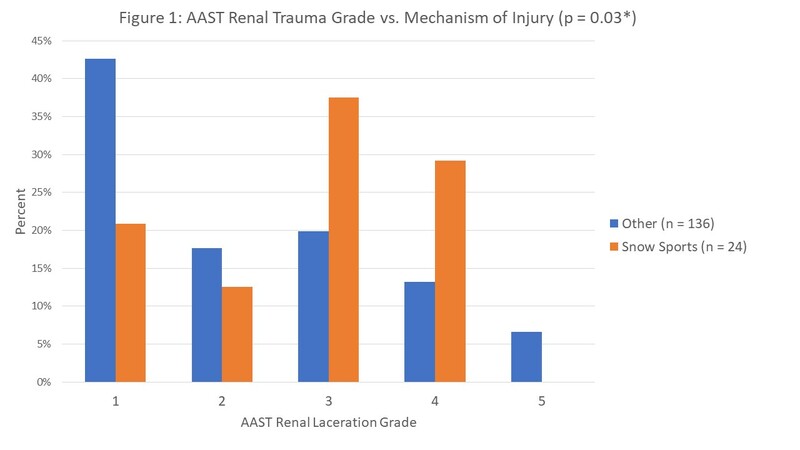 Adult renal trauma secondary to SS occurred in a younger, predominately male cohort with higher renal injury severity as compared to all blunt motorized injury mechanisms. This severity of renal trauma is in accord with its mechanism of potentially high speed blunt trauma without protective equipment, and was therefore similar to that seen with unrestrained recreational vehicular collisions. Those participating in SS may underestimate the associated risk of severe renal injury, and these data may be useful to urologists counseling patients inquiring about these risks.